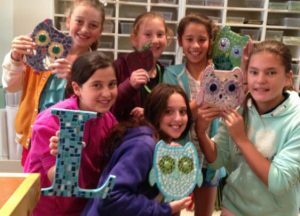 Childrens Mixed Media Mosaic Workshop. 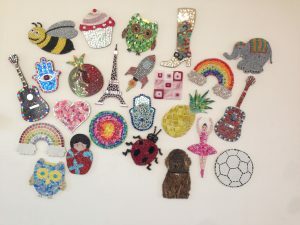 Artistic, fun and creative, your child will complete a mixed media mosaic ready to take home and hang on the wall. 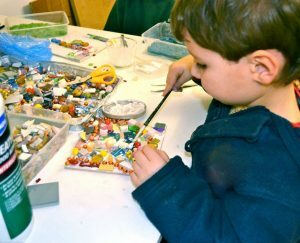 Children will create and piece their mosaic from a range of pre-cut coloured tiles, buttons, found objects, shells, plastic toys and other bits and pieces. The mosaic piece will be affixed with a hook ready to show off to friends and family. All materials are provided although you are welcome to bring along any found items, sentimental objects, shells, seaglass etc that you would like to include. This workshop runs for up to 2 hours, depending upon the age and attention span of the child. This workshop is suitable for children between the ages of 4 and 16 years although under 8’s may need a little bit of extra help from an adult.